Spring has sprung and the days are 12 hours long and all the birds are singing and all the pig arks have been spring-cleaned. We've had ten fantastic days of dry, breezy weather which has dried out all the pig paddocks. 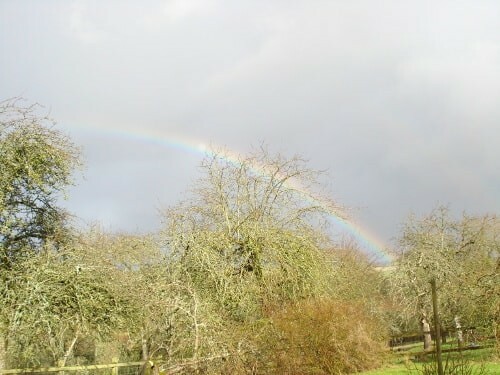 Of course, just before this we had a 24 hour storm of 60 plus mph winds and torrential rain that blew the roof off the hen house (no hens harmed, all hens safe! ), damaged a barn roof and smashed up the greenhouse. It was absolutely no fun at all to be up a ladder in weather like that trying to stop further damage to the barn roof. Anyway, we did it. We are waiting for Edna Cow to calve. She's bagging up nicely and is settled into the bovine maternity quarters. The pigs are all back out in their paddocks. Much happiness and leaping about. The youngest gilt, Elspeth who is only 3 months old, was hilarious because she was running about all over the place. It was all too exciting and there were far too many new smells to explore at the same time. Portia Pig had her litter peacefully. This is her 12th litter, and our 113th and she is a brilliant mum. The sheep are pottering about. The rams have been doing some sideways show-off jumping to demonstrate how much they are enjoying the balmy weather.